The Liberal Democrat MSP for Edinburgh Western, Alex Cole-Hamilton, has called for more co-ordination between “full fibre” broadband ISPs in the city because “residents … are at the end of their tether” due to repetitive roadworks being used to build the same type of optical fibre network several times over. In commercially competitive urban areas it’s quite normal for broadband operators to end up overbuilding each other with rival infrastructure, which is something that has occurred in the past between Openreach (BT) and UK cable operator Virgin Media. Such work can be very disruptive to local life, particularly in terms of noise, physical obstruction and travel delays. However the increasingly rapid growth of competition in the new market for Fibre-to-the-Premises (FTTP) infrastructure is slowly recreating that disruption for a new generation and may even magnify it. For example, in Edinburgh alone we’ve seen Openreach, Virgin Media, Cityfibre (Vodafone) and Hyperoptic all working to deploy Gigabit capable broadband networks and a lot of that will occur in the same areas. On the one hand this is a potentially huge benefit to consumers who will find themselves with a much wider choice of broadband infrastructure. On the other hand, aside from the issues mentioned above, it can also create a problem for the ISPs as such networks are very expensive to build and it may thus become harder to gain a return on their investment. Achieving co-ordination between such bitter rivals, which each tend to have their own build philosophies, regulatory considerations, standards, competitive interests and engineering teams (or contractors), would not be an easy task (like trying to herd lions and hyenas together). Nevertheless if this could be achieved then in theory all of the players might stand to save money and could focus more on achieving wider coverage, but for now it looks like a forlorn hope. Instead the UK Government has so far chosen not to take any action that would discourage overbuild (here), while Cityfibre and other alternative network providers have called for tougher measures to be used against arch rival Openreach (here). Meanwhile Openreach themselves have said they’re using new techniques to avoid “double digging” wherever possible and have tried to co-ordinate works with other utilities (arguably more of a reference to non-broadband utilities, like water, electricity or gas). In the end overbuild is inevitable in such an aggressively competitive market, which usually results in winners and losers (can vary depending upon the area). However there is clearly some appetite for the Government to help facilitate a more co-ordinated approach, yet it remains to see whether a compromise is possible or even if this is an avenue that will be pursued by politicians. No practical/non-damaging way to stop this happening. Frankly there are finite providers ppl should just put up with it it will only last so long and then they will have better long term bb options. Maybe the solution would be for Edinburgh or other councils to fund the work themselves and hire OR or other contractors to do the installation. Once its in place they lease the link out to whoever wants to pay for it? That way you only get one set of roadworks. That would work but they won’t put up the funding. The problem is that Ofcom wants competition at both the retail and infrastructure level, so overbuild is a natural consequence of this. NIMBY’s are there to be ignored. I see his point. There is a lot to be said for an NBN from a single provider rather than a series of competitive ones but we are where we are. 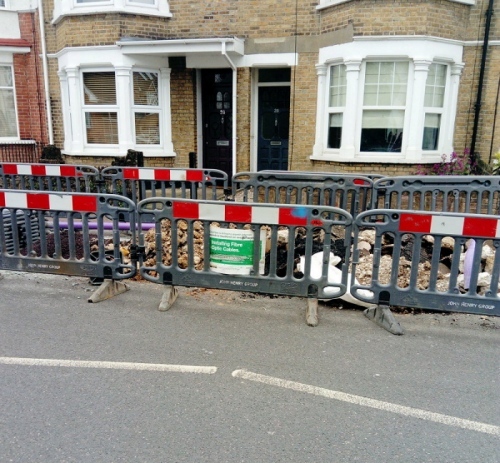 Likewise, there’s a lot to be said for coordinating roadworks between providers however that’s a tricky one for obvious reasons – both are trying to do the same thing, it’s not like one can lay inside the other’s duct, and both will be using narrow trenching. @CarlT: There is certainly some sense in having an NBN-style rollout of fibre networks, though its probably too late for places like Edinburgh and other urban areas. But it could still be done for other areas, with changes in the regulatory framework. That’s what I was referring to Carl. Though its now being interpreted with more flexibility than before and with more exemptions than when first passed. Same thing here in parkhouse Glasgow fttp and fttc installed , now virgin turning up in a few weeks time to do a network overbuild , as far as I know it is the same as above but predominantly fttp , the pavements have already been spray painted on the exact same route as th existing OR infrastructure, would it not be better for to use the ducts and limit pavement disturbance , whilst welcoming VM it will hopefully enable the 14 properties to get full fibre . OR and VM have already got a duct infrastructure. Recent fibre installation by a Altnet near me has installed fibre alongside OR and VM. It has ruined the grass verges (just raked over the disturbed subsoil instead of re-turfing) and the reinstatement of the pavement and carriageways is of varying quality. The work was completed over weeks rather than days with guarded pits and abandoned equipment left for long periods. In dense city areas this can only be worse with road and parking closures. Overbuild with the reduced percentages of take-up is not effective and guess who pays. Would we tolerate the cost of multiple provision of water, gas and electricity, answer no. In the earlier days multiple utility networks were exactly what happened. Franchising prevented this happening when CATV was deployed but we all saw how that turned out. I’d prefer an NBN but we are where we are. Having fixated on LLU Ofcom are now fixated, belatedly, on infrastructure competition while still forcing BT to continue providing copper to the exchange even where they’ve overbuilt with fibre. If a provider doesn’t show care for your local landscape then make a complaint, if they don’t fix it, don’t use them! Councillors aware but this issue is whether additional civils is necessary. Work should be done in a reasonable amount of time & not screwed up. People complain that they don’t have FULL fibre or any at all but don’t want any roads dug up. I’d happily parc somewhere else for a few days / week if I could have fibre from the cabinet to my home. As an Edinburgh resident it’s great that these companies are rushing to fttp up the place as it’s good for customers. Would be nice if they could avoid double-digging due to disruption but also so they keep investing in their networks and thus keep costs down.